Cytoplasmic β-catenin levels are normally kept low through continuous proteosome-mediated degradation by a ‘destructive complex’ of APC (adenomatous polyposis coli)/GSK-3β (glycogen synthase kinase-3β)/Axin. This is a feedback mechanism that prevents the excessive accumulation of β-catenin in cells. The Wnt complex exists on the outer membrane of cells. When cells receive Wnt signals, the degradation of β-catenin is inhibited and levels of β-catenin build up in the cytoplasm and nucleus. Wnt/β-catenin signaling is tightly regulated in mature epithelia to balance cell proliferation, differentiation and death. However, over expression of the Wnt/ β-catenin signaling is very common in cancers of all types. When stimulated, it activates β-catenin that migrates from the cytoplasm into the nucleus to activate various genes that support tumor formation and progression. 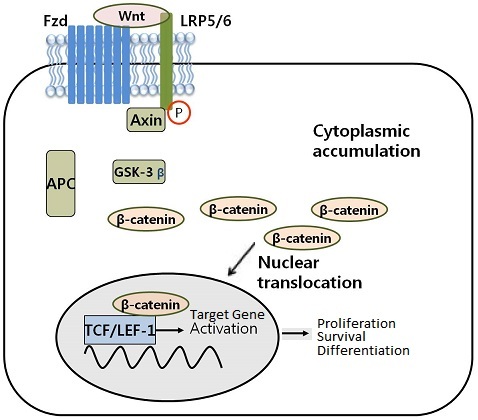 Nuclear β-catenin interacts with transcription factors, such as TCF (T-cell factor)/LEF (lymphoid enhancer-binding factor) where it serves as a transcription regulator for several genes that, in part, regulates tumor formation and progression. Thus, any agent that could attenuate the translocation of β-catenin could be extremely valuable against various cancers, especially the tumors that exhibit constitutively active Wnt/β-catenin signaling. Protein kinase A (PKA) affects cell proliferation in many cell types and is a potential target for cancer treatment. PKA activity is stimulated by cyclic AMP and cyclic AMP analogs. Thus, activators of cyclic AMP formation, via the further activation of PKA, inactivate GSK-3 thereby allowing β-catenin to remain active. The prostaglandin E2 (PGE2) and stress hormones epinephrine/norepinephrine are the major activators of cyclic AMP signaling. PGE2 acts through PKA to promote β-catenin nuclear translocation and tumor development. PGE2 is one of the prostaglandins, a group of hormone-like substances that participate in a wide range of body functions such as the contraction and relaxation of smooth muscle, the dilation and constriction of blood vessels, control of blood pressure, and modulation of inflammation. PGE2 is released by blood vessel walls in response to infection or inflammation that acts on the brain to induce fever. PGE2 also inhibits NK and gamma delta T cell cytotoxicity thereby suppresses the destruction of tumor cells by NK and gammadelta T cells. Cyclooxygenase-2 (COX-2) enzyme, a major player in inflammation and cancer, produces PGE2. Thus, the inhibition of the COX-2 can lead to inactivation of the beta-catenin/Wnt cancer development pathway. COX-2 is overexpressed in many cancers including breast cancer and colon cancer. COX-2 is inhibited by nonselective COX inhibitors such as aspirin, ibuprofen, and sulindac as well as by the COX-2–selective inhibitors celecoxib and rofecoxib. This is why celecoxib, aspirin and other NSAID drugs like ibuprofen are effective in the prevention and often treatment of some cancers. Honokiol, a phytochemical from the stem bark and root of Magnolia plant (Magnolia officinalis) inhibits COX-2 and PGE2-mediated activation of β-catenin signaling. Honokiol possesses many pharmacological activities including anti-cancer properties. Honokiol inhibits cancer cell migration and may also be able to eliminate cancer stem cells through suppression of Wnt/ β -catenin signaling, inhibition of EMT (epithelial to mesenchymal transition) and apoptosis induction. Furthermore, Honokiol targets multiple signaling pathways including nuclear factor kappa B (NF-κB), signal transducers and activator of transcription 3 (STAT3), epidermal growth factor receptor (EGFR) and mammalian target of rapamycin (m-TOR), which have great relevance during cancer initiation and progression. Green tea EGCG, Grape seed proanthocyanidins and curcumin, the active ingredient of turmeric, also inhibit PGE2 biosynthesis. Protein kinase D1 (PKD1) is a multifunctional kinase that is highly expressed in normal prostate. The decreased expression of PKD1 has been associated with the progression of prostate cancer. PKD1 interacts with and phosphorylates β-catenin. Overexpression of PKD1 represses beta-catenin-mediated transcriptional activity and cell proliferation. Therefore, synthetic or natural products that regulate this signaling pathway can serve as novel therapeutic modalities for prostate cancer prevention and treatment. Curcumin activates PKD1, resulting in changes in β-catenin signaling by inhibiting nuclear β-catenin transcription activity and enhancing the levels of membrane β-catenin in prostate cancer cells. Curcumin mediated PKD1 activation suppresses nuclear β-catenin/TCF transcription activity and inhibits the growth of prostate cancer.